CD review: "Suffer No More"
This review first appeared in the February 28, 1998 edition of the American Reporter. He never had it this good when he was alive, playing for tips on Venice Beach in Southern California, releasing only six albums over a 28-year recording career. Now, within a few months of each other and three years after his too-early death from diabetes, we have two Ted Hawkins releases. Following closely Evidence Music's release of one of his last concerts ("The Final Tour"), Rhino has now issued a retrospective covering his entire career. Considering that he only visited the recording studio a half-dozen times in a lengthy career, this is an incredibly rich collection with no filler. No surprise, though  none of the releases this compilation is drawn from have any dead spots on them, either. Perhaps because he had so few opportunities to record Hawkins simply decided to take full advantage when the occasion arose. Or perhaps, as these tracks argue, he was simply one of the most gifted singers that American popular music has ever produced, possessed of a startlingly emotive voice. 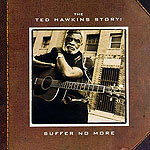 "Suffer No More" traces Hawkins' recorded career in chronological order, starting with a single and backside he laid down in 1966 for Money Records, and ending with his belated breakthrough album for Geffen, "The Next Hundred Years," from 1994. In between were a 1971 session with future HighTone Records founders Bruce Bromberg and Dennis Walker (who a decade later would discover a young Robert Cray) that wouldn't be released until 1982 (on Rounder), a 1986 follow-up on rounder, a 1985 Nashville session released two years later in Europe, an '89 England-only album, a self-financed '90 set heard here (in part) for the first time, and the mentioned Geffen outing. Not much for someone with so much to say. An interesting aspect of this collection is how little Hawkins changed over the years. Even when he was calling himself Ted "Soul" Hawkins for his 1966 single, that clear, high voice and signature guitar strumming were already there. But the most amazing thing about Ted Hawkins was that, despite his lack of financial success, his failure to earn the kind of popular acclaim he surely deserved, his music never became self-absorbed or morose. One of the previously unreleased songs, "You're Beautiful To Me," is a loving, moving paean to the United States  a country that certainly never returned the passion. There may be a few more unissued sets from Hawkins out there, as hinted by the three new songs, but most of what he recorded are already available. What "Suffer No More" reminds us is that we lost him far too soon.